The Pool Creek trail is located in the Southern Area of the Plateau Division of the Uncompahgre National Forest near Montrose, Colorado. The trail begins near Divide Road at the intersection of the Parallel and Grays Creek trails. From there the trail travels down the Pool Creek drainage for 2.7 miles to where it ends at Roubideau Creek. The trail sees most of its use in the fall during hunting season. To get to the trailhead from Montrose follow Highway 90 west for about 24 miles to the Divide Road. 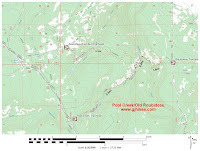 Turn right on the Divide Road and continue for another 5.26 miles to Forest Road 402.8F. Don't get confused by another sign that comes up before the 5.26 mile point that is for the Pool Creek Road, FR #548. There is limited room to park off of Divide Road. Those with a suitable vehicle can drive in on 402.8F for a couple hundred yards where there is more room to park at the junction of the Parallel, Grays Creek and Pool Creek trails. Under good conditions it doesn't require a 4-wheel drive or even a vehicle with much clearance. The trail starts out through a mixed forest of aspen, spruce and pine trees. For the most part the trail is very distinct and easy to follow. There were a couple of trees that had fallen since the last time any maintenance had been done but they were easy enough to bypass. If memory serves well this trail was also opened to dirt bikes sometime in the past. The elevation profile for the trail shows the constant gradual downhill slope that it has over its entire length. Eventually the trail finds its way deep enough into the drainage that it is traveling close to the seasonal Pool Creek. About a third of a mile from where Pool Creek runs into Roubideau Creek the trail enters a small clearing. There are routes at this point that go both to the left and to the right. The course to follow though is straight ahead along the left side of the creek bed. 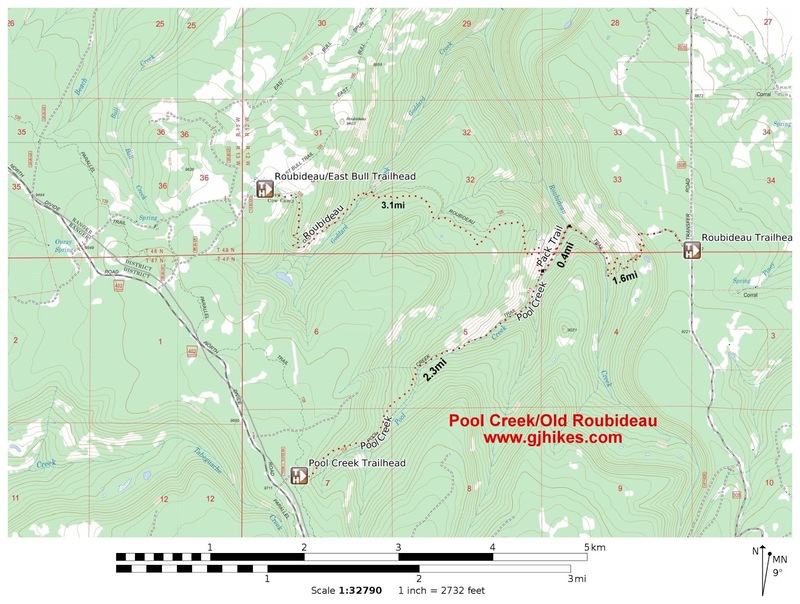 Looking at a map that shows both the Pool Creek and the Roubideau Pack trail seems to indicate that the spot that is 0.3 miles from Roubideau Creek is probably the end of the Pool Creek trail. That would make one of the trails that goes to the left at this spot the section of the Roubideau trail that runs on over to the Gray Cow Camp on the East Bull Road. 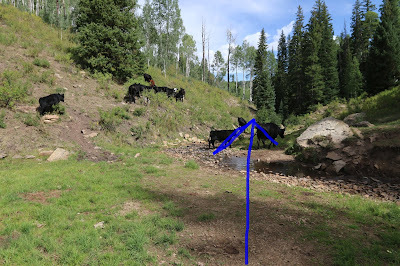 We haven't been on that section of trail yet so we can't speak to it but we can say that there are a confusing number of cow paths leading in that direction and from what we can see there are no trail markers. What we would probably do before trying to hike it is to outline the route using the software that came with our GPS and then convert that into a GPX file and load it into our device so we would at least have something to go by. The actual trail would turn out to be different but it should be close enough for us to use as a guide. 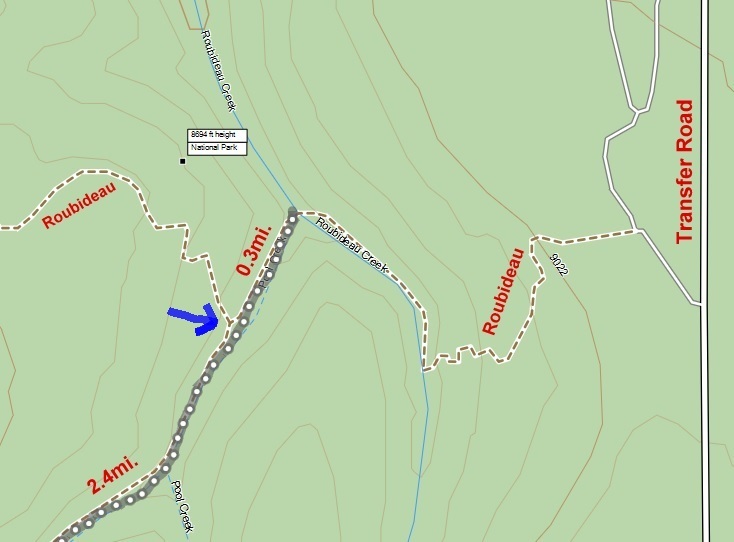 We might also zoom in on Google Earth and create a few waypoints in places that look like part of the trail. Extra preparation usually pays off for seldom used or unfamiliar trails where the chances are high that you won't see any other people. Whether we had already reached the official end of the trail or not is hard to say since there aren't any trail signs to go by and since the Forest Service website implies that the trail ends at Roubideau Creek which is only a little more than a quarter mile away there isn't much reason not to keep going. 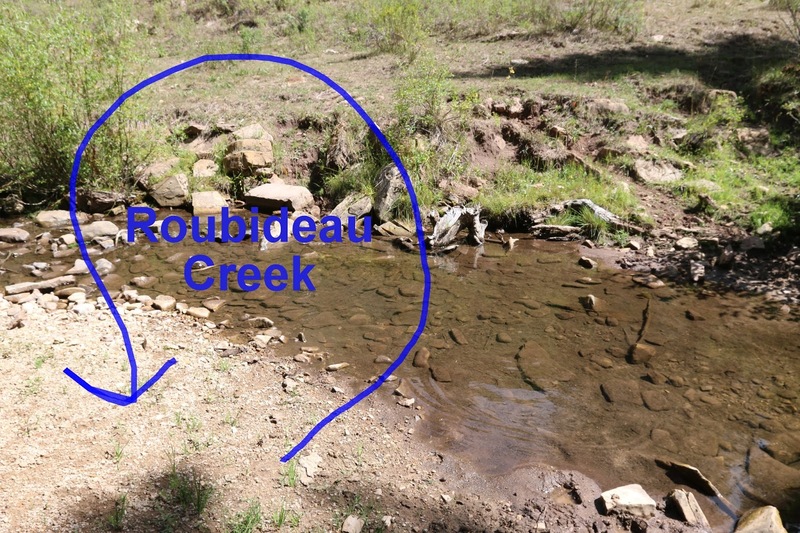 At present there aren't any trail signs once you reach Roubideau Creek either. One thing that is very interesting though is that were fish that ranged from 1/2 to 3 inches long darting around in the very shallow water. You would think that fish would winter kill in such shallow water so it is a bit of a head scratcher unless there is a nice sized beaver pond nearby. Hiking back up the Pool Creek drainage goes by pretty quick. With a little over 1100 feet of elevation gain stretched out over 2.7 miles it isn't really all that steep by Colorado standards. We've talked with a few people that have hunted in the area and they thought of it as steep so we went with that and rated it as strenuous. Hikers and horseback riders that don't especially like multi use trails should find Pool Creek to be a nice option. If you would like to see it for yourself then all you have to do is 'Take a hike'.